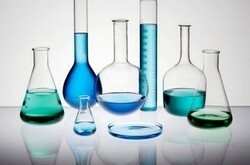 Manufacturer and Supplier of Chemical Glasswares. Our product range also comprises of Sewage Treatment Plants, Air Pollution Control Devices and Industrial Chemicals. We provide wide range of Chemical Glasswares that is widely used in educational institutes and research & industrial laboratories. This glassware is high on quality, reliability and durability and available in standard designs and measures. Further, we offer these products in all types of sizes and shapes at the most competitive prices.